On Nov. 14th we posted about a piece at The Independent by Sarah Helm, who, as we’ve noted, is one of the more biased reporters we’ve come across in years. Within Helm’s completely one-sided, tendentious and at times conspiratorial account of the recent violence between Hamas and Israel, were a few factual errors. We brought these to the attention of Indy editors who, after two weeks, have corrected one. (They’re still weighing the merit of our other complaints about the article). Though editors didn’t remove the false claim, they at least added Israel’s denial. Israel deny [sic] reports that the operation was intended to kill or abduct militants in Gaza. We’ll update this post when hear back from editors about the other errors in Helm’s piece. 1 down, 999 to go. “Israel deny [sic] reports that the operation was intended to kill or abduct militants in Gaza” – but maybe it was to kill antisemitic terrorists. You mean 999,999,999 to go this month, right? Tangentially, Helm has tweeted that she hopes that US Border Patrol guards are not taking lessons from the IDF. I replied that she’s invited to catch one of those incendiary balloons to prove how harmless they really are. 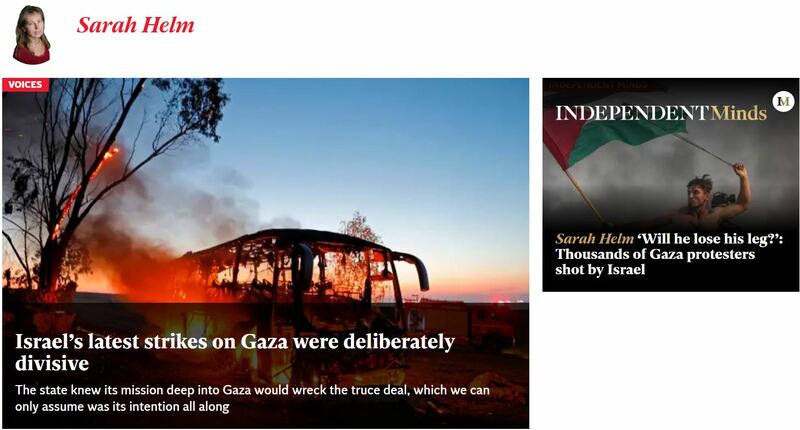 Or have Sarah Helm stand with her family within 50 feet of a “harmless” exploding kassam rocket. It’s a firecracker. A really big, gigantic one.